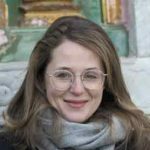 Blog Life in China What Are Century Eggs? And Should You Try Them? What Are Century Eggs? And Should You Try Them? What Are Century Eggs and Should You Try Them? Have you ever heard of century eggs? 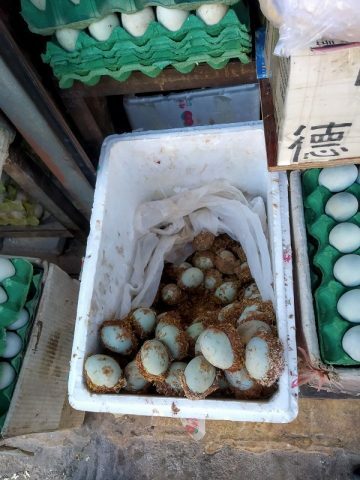 Much like stinky tofu and birds nests, century eggs belong to the group of infamous weird, ancient and mysterious dishes from the Middle Kingdom that only the bravest of foodies dare to try. 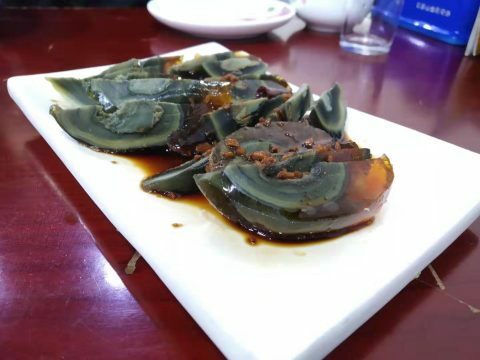 Century eggs, with their gelatinous consistency and green-black colour, might sound, smell and look off-putting at first, but in China, they are quite popular and a lot of restaurants all over the country have them on the menu. Chapter 1 – How Old Are Century Eggs Really? Chapter 2 – What is the Origin of the Century Egg? Chapter 3 – How Are Century Eggs Made Today? How Old Are Century Eggs Really? 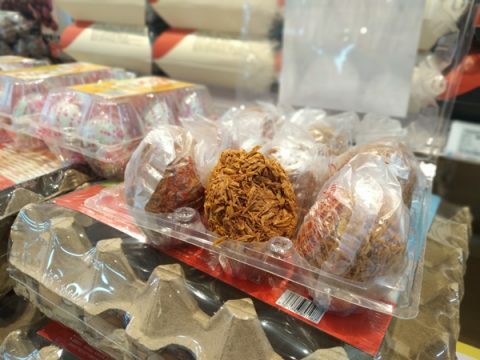 The century egg, also known as 1000-year-egg or millennium-egg, has a different name in Chinese and it doesn’t refer to its alleged age but to its look: 皮蛋 (pídàn), which actually means leather egg. A century egg is not really a hundred years old, more like a few months. So what is it exactly? In short: Century eggs are fermented duck eggs. What is the Origin of the Century Egg? Like any good dish, this one comes with at least one legend about how it was created. One story goes back to the time of the Ming Dynasty, 600 years ago. There was a small tea house in Wujiang, Jiangsu province. Business was good and there were a lot of customers. Due to all that hustling and bustling the owner was too busy to properly rinse out the teapots and dispose of the used tea leaves left in the tea pots before serving the new customers. So he just quickly threw the tea leaves into the oven, together with the ash. He also kept a couple of ducks, and they sometimes lay their eggs in this pile of ash. By chance, some of the eggs were left there. The shopkeeper found them a few months later when he wanted to clean the oven. The eggs were black but he tasted one and found it to be delicious. By coincidence, the century egg was born. How are Century Eggs Made Today? To this day, the process of making this ancient delicacy has not changed much during past centuries. To make them, uncooked duck eggs are put in a vat with a mixture of spices, such as anise, pepper, fennel, salt along with tea leaves, quicklime, sawdust, wood ash and warm water. Then you wait for the egg to soak in this mixture for approximately three months. During this time the pH of the eggs increases to 9-12. The chemical processes transform the protein into a gelatinous, black-green mass and the yolk turns dark green. The whole egg is preserved by it. Century eggs are quite popular in China and a common cold dish that you can order as a starter in a lot of restaurants. The egg, without its shell, is cut into six to eight pieces that are fanned out on a plate, so the bits of egg are easy to grab with chopsticks. You can also add it to warm congee or even find it as a filling in some Chinese pastries. The perfect egg has a large, velvety yolk surrounded by jelly-like layers of blue, green and brown, the rings indicating the different stages of fermentation. Admittedly, the texture and the ammonia-like smell are something to get used to. The taste is quite nice, with a bit of a rotten aftertaste. Drizzle a bit – or a lot – of vinegar or soy sauce on it and devour. What is Tofu and How is Tofu made?